The final rosters for the 2019 McDonald’s All American Games will be revealed on Thursday, Jan. 24 at 3:00 P.M. ET on ESPN’s “The Jump” and at 6:00 P.M. ET on SportsCenter. 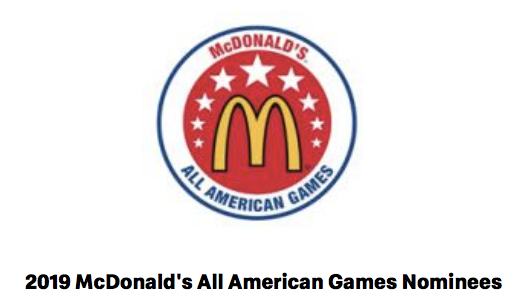 Follow @McDAAG on Twitter and Instagram for the latest news and announcements. If Samantha makes the final roster, we will share ticket information and more here. Good luck and congratulations, Samantha! –Article contributed by WPMQ Staff. The CHS Student Council has released details regarding basketball homecoming week and invites any and all to join them not only in crowning this year’s royalty, but also in supporting their efforts to give to those in need. In lieu of a traditional spirit week, the CHS student council is partnering with student councils from Charlestown Middle School, Jonathan Jennings Elementary School, and Pleasant Ridge Elementary School to bring the community its “In the Spirit of Service” week. Each day a dress up theme was selected in traditional fashion, but it was selected with a need for service in mind. Students (and community members) are invited to donate items that match the daily themes and those items will go to an organization in the community that provides for those in need. Girls basketball homecoming and the king’s ceremony will be held Thursday, January 17th between the JV and varsity game vs. Salem. The boys basketball homecoming and queen’s ceremony will be Friday, January 18th between the JV and varsity game vs. Eastern. Recently Senior Lady Pirate Basketball player Samantha Matthews gathered with family and school officials to sign a letter of intent to attend and play women’s basketball at the University of Tampa. Samantha stated that the day was a day she dreamed about since she was a child. She feels like Tampa is the best fit for her because on her visit, it felt like a place she could call “home.” She added that it was a strong school academically and feels she will fit in with the coaches. 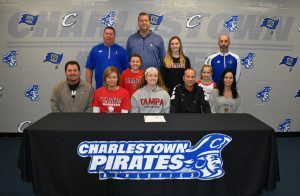 During Samantha’s signing, shown seated at center, she was joined by her parents Paige Barrett and Scott Matthews (Lady Pirate Head Coach), seated on either side. Samantha was also joined by her stepmother Candace Matthews (seated far right front row), her stepfather Jeff Barrett (seated far left front row). Shown left to right standing and supporting Samantha are Lady Pirates Assistant Coach Jason Hawkins, sister Sloane Barrett, CHS Athletic Director Chad Gilbert, stepsisters Skylar Cochran and Alexis Finchum, and Cross Country Coach Jerry Doyle. Congratulations to Samantha on her decision to play college basketball at the University of Tampa and best wishes for a successful education and career. WPMQ’s Sports Broadcasting class recently produced its second episode of “Talk the Plank” a sports recap of recent events. To find out what’s been happening in winter sports–boys and girls basketball, swimming, and wrestling–so far this season, watch their video below! Then, be sure to follow them on Twitter @WPMQ993 or subscribe to their YouTube channel at https://www.youtube.com/WPMQCharlestown . The Lady Pirates entered the basketball game Saturday night with more on their minds than just a Mid-Southern Conference match-up. Having learned just the night before that a former assistant coach had suddenly and unexpectedly passed, the team was on a mission to honor Coach Chad Crace in their efforts on the floor that night. Adonned in matching headbands with “Crace” across them, the girls took the floor and set out to execute their game plan, which for the most part, worked all night. It was a back and forth contest, which saw Samantha Matthews score her 1,000th point as a Lady Pirate. After the first quarter, North Harrison led by 1, 7-8. At the half, the game was tied 17-17. To end the 3rd, the Lady Pirates were up 35-30. But after the Lady Cats found a hot hand and their way through the lane in the 4th, they were able to edge out the Lady Pirates 52-50. Samantha Matthews finished as the game’s leading scorer with 26, while North Harrison’s Miss Basketball prospect and close friend of Matthews, Lilly Hatton, finished with 22. For the Lady Pirates, Biscardi finished with 11, Watson with 8, and Crace with 5. It’s also worth noting the Lady Pirates hit 10 threes on the night. The Lady Pirates are back in action Wednesday when they host Silver Creek. Last Friday night the Pirate football team went to the locker room with their sails a little deflated as their star running back, junior Marion Lukes, remained supine on the field in pain from a shoulder injury incurred on the last play of the first half. 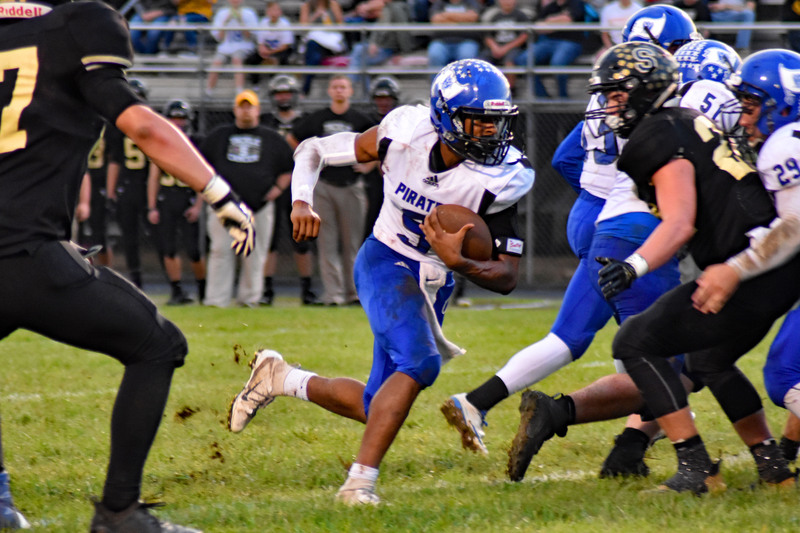 The Pirates had other weapons last week that were able to step up in Lukes’ second half absence and take care of business against Corydon, and while they won 41-7, the concern about #9 and his injury weighed on their hearts. But tonight, after a late afternoon thunderstorm rolled in to Salem and looked to dampen our spirits, the Pirates took the field with Lukes in blue and white. Concerns about the field conditions may have been on the minds of the Pirate faithful, but for Lukes and the Pirates it was business as usual. The first drive of the game gave the fans a lot of ground work to watch, which set their minds at ease about whether or not those field conditions would give the Pirates any trouble, as Lukes and Logsdon took turns with carries until Lukes eventually churned out a touchdown with 3:23 left in the first quarter. On the second play of the second quarter, Lukes took the football 68 yards to the Lions’ end zone to put the Pirates up 14-0. Andrew Mattingly would tack on three more points for the Pirates with his first made field goal of the season at the 3:41 mark. The Lions’ next drive would end in a scoop and score by the Pirate senior Candido Martinez who was able to recover a bad snap to the Salem punter that he couldn’t control and take it to the end zone, putting the the Pirates up 24-0 with just 1:14 before the half. Lukes would head in for halftime with 143 yards on 13 carries, just 95 yards short of the single season rushing record of 1,995 yards set by Richard Lanham in 1989. With just over six minutes to play in the 3rd and a few yards and carries later, Lukes was able to shake a couple defenders and then it was good bye, see ya later Marion Lukes and the Pirates’ single season rushing record. The 83 yard touchdown run would give Lukes all he needed to re-write another category in the record book. This would be the second this year as he broke the single game rushing record at Clarksville, making that new record 475 yards. The Pirates would lead 30-0 before giving up a pair of touchdowns and a two-point conversion to the Lions that would make the score 30-14 with 11:35 to play in the game. Addison Logsdon, who would finish the night with 51 yards on 11 carries, found his way to the end zone with a 10 yard touchdown run at the 3:54 mark that the Pirates hoped would seal the victory at 37-14. Then junior cornerback Brice Sweeney got his second interception of the night for the Pirates to all but guarantee the road win with 1:43. Marion Lukes would cap off his record breaking night with 311 yards on 25 carries and 3 touchdowns for the Pirates. His single season yardage now totals 2,306 with a regular season game remaining before the sectional as the Pirates host Eastern next Friday on senior night. The Sports Broadcasting team for WPMQ has been working this first quarter of school to produce a weekly sports recap and today was the release of the first episode. Students have made major improvements to the aesthetics of their news cast over last year’s “View from WPMQ” already. Their teacher, Melissa Stewart, said she is proud of their efforts to stay abreast of all the results of our Pirate athletics and to get this going, but she knows there is a lot of work to do to work on presence and poise, as well as the sports writing that is also contributed here on Pirate Pride. If you would like to watch Talk the Plank, check it out with the link below and subscribe to WPMQ’s YouTube Channel for other videos.